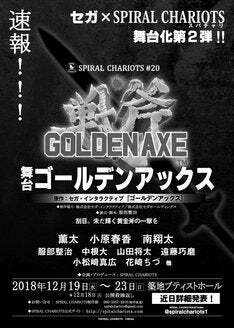 Sega game Golden Axe is getting a stage play adaptation in Japan this December. Sega game Golden Axe is getting a stage play adaptation in Japan this December. Costumes and stage photos haven’t yet been released, so it’s unclear how the play will address muscle-bound giants, skimpy outfits and fire-breathing creatures.